Guide to Kawasaki Teryx Models. Our Kawasaki Teryx Guide covers all the 2013 models with the details, specs, and differences for every model in the Teryx line. Find out what's new and what may be coming in the near future. Let's start with the base model Teryx and work our way up from there. Several variations of both the two seat and four seat models provide just about something for everyone. Kawasaki Teryx models offer great value for the price. 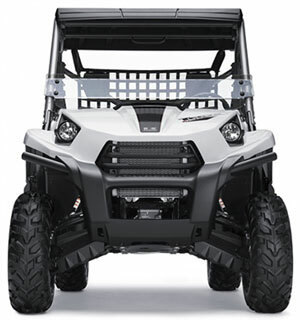 The base model Teryx comes well equipped with a fuel injected 750cc V-twin engine with liquid cooling. It's connected to a CVT transmission with Hi-Lo range and a Kevlar reinforced belt with a computer controlled slip protection system for better belt life. You can choose between 2 and 4 wheel drive with a dashboard switch, and there's a variable front diff lever between the seats. We're not big fans, but the Kawasaki Teryx has kept this system for several years. Suspension is independent front and rear, with gas charged shocks at each corner. Wheel travel is about 7.5 inches at each wheel. Piggyback reservoirs help keep the shocks cool, and a rear anti-rolll bar holds body lean to a minimum. Braking is by twin front discs with two piston calipers at each front wheel. Rear braking is by a central mounted, sealed, wet mult-disc setup. Benefits are extra ground clearance and less maintenance. Terlyx tilting bed has a 500 pound capacity and lots of room. Utility is aided by a tilting bed with gas struts. And it's not just for show with a 500 pound capacity and tie down hooks in each corner. You also get a standard cargo net for even more convenience. The interior of the Kawasaki Teryx is what we would call no frills with basic bucket seats and a padded steering wheel. You will find what Kawasaki calls a "multifunction digital display" in the dash. The single display gives you all the info that Kawasaki thinks is worthy. 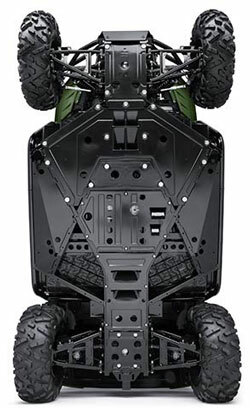 The scratch resistant plastic bodywork comes in a color called Super Black on the base model Kawasaki Teryx. Rock protectors and skid protection is standard, along with the twin head and tail lights. Telyx LE with roof and windshield. The LE version come in Metallic Stardust White. You get all the same features of the base model plus a half windshield and rigid top for a little more occupant protection. The LE package also includes retractable cup holders and the claim that the paint is more scratch resistant than most plastic. Pretty much just what you would think. A Kawasaki Teryx LE with Realtree camo applied to the body and wheels. You get some functional upgrades with this one. Aluminum wheels shave a couple of pounds of unsprung weight from each corner. Throw in better shocks with adjustable damping and it all adds up to noticeably better handling. Teryx4 in Bright White with matching door panels. The 4 seat Teryx isn't a clean sheet design but it does have some significant differences from the 2 seat model. Let's run through the most obvious ones and then we'll fill in the details. EPS - First up is the variable assist electric power steering. On a machine the size of the Teryx4, power steering is a must. This one is both speed and torque sensing to provide just the right amount of assist for the best feel. When the going gets rough and you have to lock in the 4 wheel drive, you don't have to worry about getting in a wrestling match with the steering wheel. All you have to concentrate on is driving, and that's a good thing. CVT with centrifugal clutch - Kawasaki decided that Yamaha had a better idea with a centrifugal clutch added between the crankshaft and CVT clutch. We agree. This system offers much better throttle response and longer belt life. New front diff - We weren't ever big fans of the variable (by hand) front diff lever. Evidently, neither were a lot of other people. You won't find one on the Kawasaki Teryx 4 models. It's been replaced by a more conventional limited slip diff with a switch to lock in 4 wheel drive. We approve. Other unique features for the Teryx4 include individual bucket seats for 4, complete with hand holds, seat belts, and cup holders for each. Latching doors and a car-like center mounted parking brake are also nice touches. 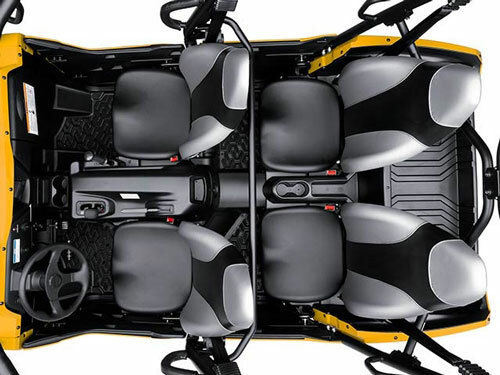 The Teryx4 has bucket seats for everyone with plenty of room. This 4 seater is definitely a big machine with plenty of room for passengers and ample cargo space. But on the other hand, it has a relatively short wheelbase for better maneuverability in tight spaces. 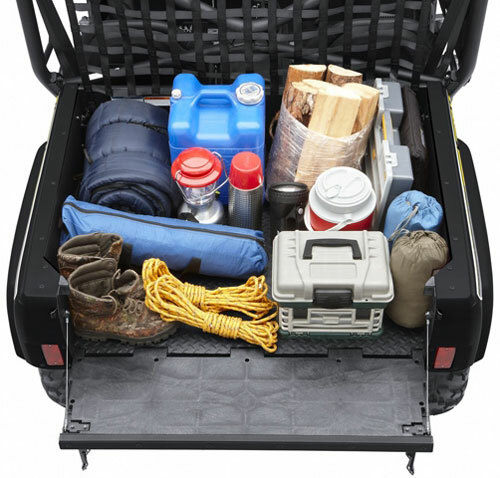 It does need mentioning that even though the cargo bed is fairly roomy, it's total weight capacity is about half that of the 2 seater Teryx. Teryx4 frame bracing and skid protection. One other thing we liked were the fender extensions for better mud protection. Handy if your fellow riders would rather look at the scenery than wear it. You get to choose from three colors consisting of Bright White, Super Black, and Scout Green. Door panels match the Super White, but are all black with the other colors. As you might have guessed, the frame is substantially larger, and carries additional bracing to maintain adequate stiffness and protection. There isn't a full skid plate underneath, but the engine, drivetrain, and suspension appear to be well covered. Like we said, it's not a completely new Teryx from the ground up, but as you can see, there are enough differences to notice. The LE package adds 12 spoke aluminum wheels, a full length roof, 2-tone bucket seats for four, and body color door panels. Color choices are Sunrise Yellow or Firecracker Red for 2013. Here's a nice video test of the updated 2014 Teryx 4 800. We really like the addition of the new clutching system on the Teryx4. The improvement in low speed throttle response and extended belt life are worthy benefits. The EPS is also a great addition to the Teryx line up, although it isn't available yet on the two seaters. A vehicle as large and heavy as the Kawasaki Teryx 4 makes it a necessity. With all that said, the competitive landscape has changed dramatically in the years since the Teryx was introduced. The two seat model is basically unchanged form its' original configuration from 2009. Many other manufacturers now offer models with larger engines, more power, and better handling. Good access takes the hassle out of maintenance. What they don't offer is a better value for the price though. 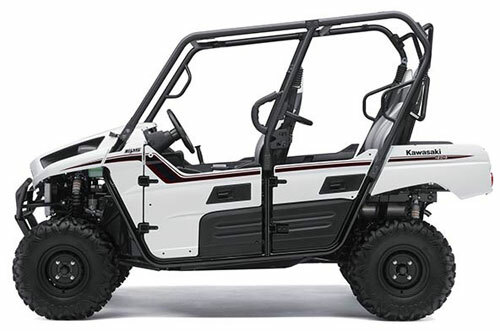 The Kawasaki Teryx has an awful lot of features at a very reasonable price. And since there haven't been any significant changes in the last few years, carryover models offer a terrific value for the money. 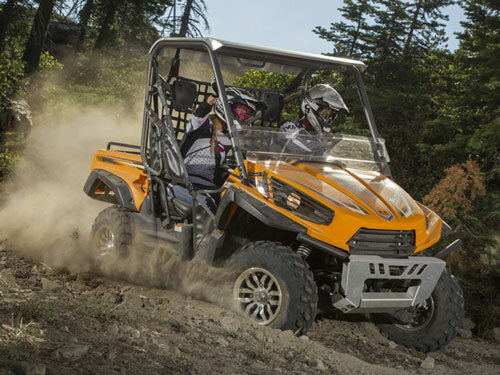 The Teryx 4 comes with more features compared to other models, but the pricing is closer to those models so the difference in value doesn't seem as great as the 2 seater. The Teryx 4 doesn't seem what we would call underpowered, but there's no denying you can feel the difference from the standard two seat Kawasaki Teryx. Which brings us to the rumors section. 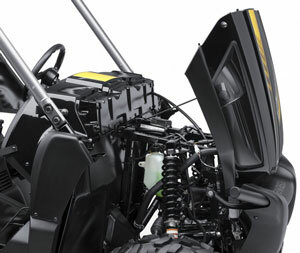 Lots of rumors circulating about larger engines, major updates to the two seat Teryx, and maybe even a whole new high performance model similar to the Polaris XP and Arctic Cat Wildcat. With Kawasaki's reputation and history of performance, we can't imagine them staying out of that fight.